The U.S. State Department just approved a $3 billion arms deal with Japan. Yesterday, the U.S. Defense Security Cooperation Agency (DSCA) announced that the U.S. State Department approved a possible $3 billion sale of 17 V-22 Osprey military transport aircraft and associated equipment to Japan. U.S. Congress now has to approve the concept of the sale and the Japanese government will also have to give the go-ahead before companies can agree to term and delivery dates, USNI News reports. In January 2015, the Japanese diet approved a defense budget that called for the purchase of five Ospreys. Deliveries of all aircraft are expected to be completed within the next five years. Japan is modernizing its transport fleet to better support its defense and special mission needs. The proposed sale of V-22B Block C Osprey aircraft will greatly enhance the Japan Ground Self-Defense Force’s humanitarian and disaster relief capabilities and support amphibious operations. This sale will promote burden sharing with our ally and interoperability with U.S. forces. Japan will have no difficulty absorbing these aircraft into its armed forces. The sale also includes 40 Rolls Royce Engines, 40 InfraRed Radars, 40 Missile Warning Systems, 40 Countermeasure Dispenser Systems, 40 Global Positioning System (GPS) Receivers, and 80 Night Vision Goggles, among a host of other items, the DSCA press release states. Japan’s Maritime Self Defense Force’s newest 19,500 tons helicopter carrier, the Izumo, has a large and robust enough deck to accommodate the Osprey fleet, according to the Japan Times. The Ministry of Defense also wants to use the Osprey in the defense of Nansei Islands, including the Senkaku Islands, Japanese media reported in 2012. The new fleet will in all likelihood be stationed in Saga Prefecture, in the northwest part of the island of Kyushu, due to its close proximity to the East China Sea. “This proposed sale will contribute to the foreign policy and national security of the United States. Japan is one of the major political and economic powers in East Asia and the Western Pacific and a key partner of the United States in ensuring peace and stability in that region. It is vital to the U.S. national interest to assist Japan in developing and maintaining a strong and ready self-defense capability,” the DSCA emphasizes. 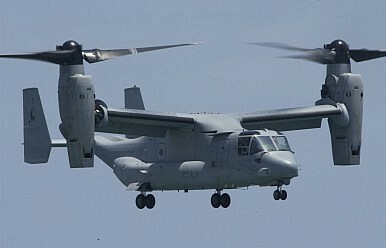 U.S. defense contractor Boeing has been awarded a $545 million contract for the delivery of 4 V-22 aircraft to Japan.